I have a bit of an obsession with Brioche. My new favorite is these Chocolate Brioche Buns, which are small rounds of soft and tender Brioche with a piece of chocolate hidden in the center. You can use semi sweet or bittersweet chocolate, but my favorite is milk chocolate. Before baking I like to sprinkle the tops of the Brioche with pearl sugar which not only looks good but adds crunchy bits of sweetness. Absolutely perfect with a cup of coffee or tea. A few notes on technique and ingredients. This dough is kneaded for a long time (20 to 25 minutes) which produces a strong dough that cleans your mixing bowl and is silky smooth (but not sticky). If you're new to bread making, I would watch the video as I show you an easy way (the 'window' test) to determine if your dough has been kneaded to the correct consistency. After the first fermentation (proofing), I like to refrigerate the dough overnight. This improves the flavor of the Brioche and also makes the dough easier to work with. As far as ingredients go, for the yeast, I like to use SAF Gold instant yeast which is used in baked goods that are high in fat and/or sugar. This type of yeast gives a good rise and it doesn't need to be proofed. However, you can use active dry yeast for instant yeast, but you will need to increase the amount of yeast by about 20%. For the salt I like to use kosher salt. For the butter, I like to use unsalted butter. 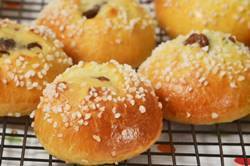 Brioche: Place the flour, yeast, and salt in the bowl of your electric stand mixer, fitted with the paddle attachment. Beat until combined. Add the eggs and milk and beat until combined. Replace the paddle attachment with the dough hook, and knead the dough on 1st speed for four minutes. Increase your mixer speed to 2nd speed, and continue to knead the dough for another three minutes. Next, with the mixer on 2nd speed, gradually add the sugar over five minutes. Place the cold butter between two sheets of parchment or wax paper. With a rolling pin, pound the butter until it's pliable but still cold. Cut the butter into pieces and add it to the dough. Knead the dough, on 2nd speed, for another 10 to 15 minutes or until the dough cleans the bowl and is smooth (not sticky) and elastic. To check to see if the dough is fully kneaded, use the 'windowpane' test. (See video for demonstration.) To do this, start with a small fistful of dough. Gently stretch it. For a fully kneaded dough you should be able to stretch the dough quite thin, without it tearing, so that you can almost see through it. Next morning, line two baking sheets with parchment paper. Place the rounds of the dough onto the baking sheets, spacing them several inches apart. Cover loosely with plastic wrap that has been sprayed with a non stick spray or lightly oiled (this will prevent the buns from sticking to the plastic wrap) and let proof at room temperature (about 73 - 76 degree F) (23 - 24 degree C) until nice and puffy and almost doubled in size (because the dough is very cold, this could take 1 1/2 to 2 hours). Next, preheat your oven to 350 degree F (180 degree C) with the oven racks in the top and bottom thirds of your oven. When ready to bake, remove the plastic wrap and, with a pastry brush, lightly brush the tops of the Brioche with the beaten egg. (This will help with browning and gives the Brioche a nice shine.) If desired, using kitchen scissors, cut an "X" into the center of the brioche dough (See video for demonstration). Sprinkle the Brioche with pearl sugar. Place the two baking sheets of Brioche in the preheated oven and bake about 16 minutes or until golden brown. Rotate your baking sheet top to bottom and front to back about halfway through baking. Remove from oven and place on a wire rack to cool for about five minutes before transferring to a wire rack to cool completely. Can be covered and stored for two to three days or they can be frozen for about one month. Makes about 19 Chocolate Brioche.